Scottsdale is really a very handy place to get to from anywhere in the world. Take a flight direct from San Francisco to Melbourne. Then take a flight direct from Melbourne to Launceston. 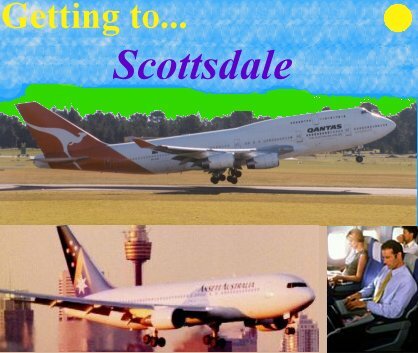 Use a rental car from Launceston Airport to Scottsdale. On exiting the Launceston Airport, turn right towards Launceston. Drive for a couple of kilometres, and at the roundabout, take the main highway to Launceston (straight ahead). After 8km or so, take the left exit to Kings Meadows, St Leonards. *Drive down here to the traffic lights, and go straight ahead, along Quarantine Road, continue to go straight ahead through the two roundabouts, and when you come to the T-junction at St Leonards, turn left, go straight ahead for 100m or so, and turn right up Abels Hill Road. After 3km or so, you will come to the junction with the Tasman Highway. Turn right here, and you are on your way to Scottsdale! On the way, stop for a bite to eat at pretty Myrtle Park, by the river. Also drive the 14km up Mt Barrow, for a look at the spectacular views and the waterfall. On the top of the twisty Sidling Road, stop at the lookout for more great views of the area where you will spend your next few days. Follow the signs from the ferry terminal to the Bass Highway to Launceston. Stay on the Bass Highway the whole time, and on entering Launceston, you will come to an exit pointing towards Hobart. Take this exit, and stay on the road for 2km or so. Then take the left exit to Kings Meadows. Now use the guide above from the asterisk. For further information and maps, see Location. Please don't be disappointed if the weather is bad, eg, it is raining. Wait until it stops raining! It is a fact of travel that the weather cannot always be good. Stay a while and talk to the friendly locals. Home | Location | Sport | Nightlife |Attractions | Accommodation | Links | Email Us!